Date night is always something I eagerly anticipate and is a must for me and my husband as we try to do it each week! As we all know, Valentine’s Day is approaching, and if you’re like me, you’re still a romantic at heart and love the notion of expressing your love even in the smallest of ways. Usually a nice dinner at one of our favorite restaurants is on our agenda for this occasion. Style Tip: This awesome look showcases a few simple ways to spice up your guy’s basic suit. A gorgeous cashmere scarf in a subtle pattern is a great winter addition. While a pop of color through a pocket square or button down are year round options. For colder days, try styling him in a layered suit look comprised of a fun button down with a more classic, basic sweater over it. Style Tip: Whether your guy prefers a blazer look or a more casual vibe, these understated, tailored outfits will look great on him. To vary it up from your menswear basics, try a blazer in a more unique fabric, like boiled wool, cashmere or velvet. Another fun touch is the use of a pocket square in a more dressy casual (aka non suit) look. And lastly, for the non-blazer lover a modern bomber jacket is very cool. 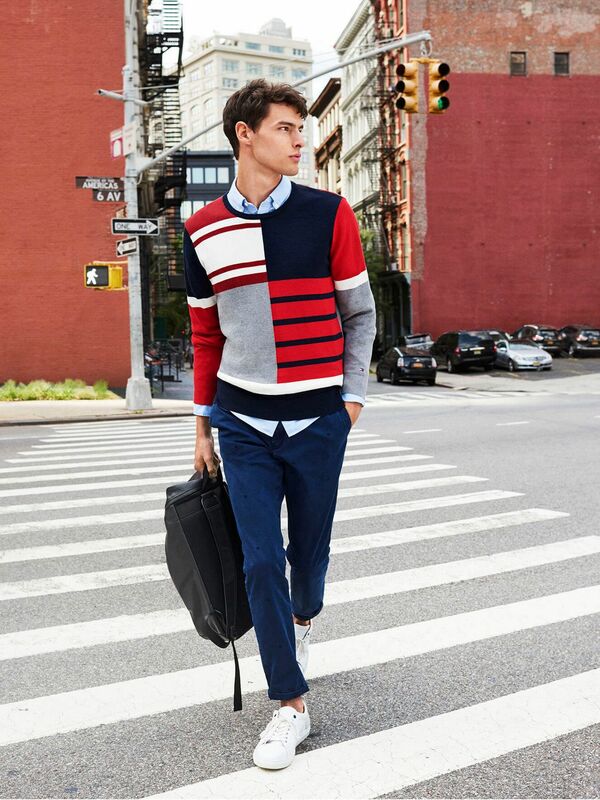 Style Tip: For a polished casual look, why not snag a color blocked or geo pattern sweater for your guy. If he prefers a more classic, subdued outfit then have him keep the rest of the look neutral and basic, such as a pair of chinos and a blue oxford. Lastly, stylish sneakers are in style for the guys too, so if he’s up for it grab him a pair of old school sneakers by New Balance, Nike, Adidas or Converse. Style Tip: Did you know red is a neutral? Yes, even for the guys! A pair of red (or burgundy) chinos look fresh and modern this winter. If your guy is more classic, then keep the rest of his outfit neutral and tailored. And there’s nothing more handsome than a guy in a beautifully fitting trench coat, so make sure to add that to your guy’s shopping list! And of course, you know that I’d never forget about you! I have curated a Looks for Less: Date Night Edition with YOU in mind! Needing inspiration for your own evening wardrobe? Join the SYC Society HERE to get out of your date night outfit rut, learn some fresh new outfit ideas, and shop the guide directly with items to fit every budget!